Eventide’s H9 pedal continues to grow in scope as more dedicated algorithms are released for it — you might think of it as buying plug-ins for your hardware. Over the past year or so, the pedal’s repertoire has expanded to include SpaceTime, CrushStation and very recently Sculpt, a novel split-band distortion algorithm with some wah/synth-style filtering thrown in. I’ll cover the essentials of those earlier additions before concentrating on Sculpt. While the H9’s algorithms usually focus on performing a single task in a very detailed way, SpaceTime is a true multi-effects algorithm allowing the simultaneous use of modulation, two delays, and a reverb. The delays are derived from the TimeFactor pedal’s Vintage Delay while the reverb section incorporates elements from the Space pedal’s Plate algorithm and from the UltraReverb plug-in. The delays and reverb may be configured in series or parallel after the modulation section allowing some wonderfully rich sounds to be created. It’s a bargain — get it! SpaceTime may be destined to play nicely but CrushStation turns that on its head, offering a range of distortion types that combine distortion and multi-band EQ with up-down octave shifting. With separate controls for drive, sustain, sag, octaves and grit, you can do a lot of damage. Soft saturation can be achieved but this algorithm is clearly happiest creating the type of sonic mayhem that should keep the creators of neo-industrial, post-apocalyptic trance/dance, drum-no-bass EDM (OK, I made that one up...) very happy. The wet and dry sounds can be balanced to create parallel distortion effects. Sculpt is the most recent addition. Essentially, Sculpt splits the audio signal into high- and low-frequency bands, with a user-adjustable crossover point, to which different amounts of overdrive gain can be applied. Compression may be applied either before or after the distortion stages; the compressor parameters are self-adjusting to maintain a stable overall volume level, so there’s just one knob to adjust. Tunable peaking filters can also be placed before or after the distortion, and the Env-Filter control forces the filter frequency to follow the signal envelope to produce auto-wah effects. A switchable noise gate is included to keep things quiet, the wet signal can be blended with the dry, and if you run two amps, you can route each band to its own amplifier. In contrast with CrushStation, Sculpt’s distortions sound much smoother and more musical, many of the presets offering a viable alternative to a guitar distortion pedal, for which role the ability to apply more or less saturation to the two bands makes a wide range of overdrive sounds possible. The filters further widen the range of available sounds, as demonstrated by the presets that go from warm jazz guitar to strong fuzz filter sounds. 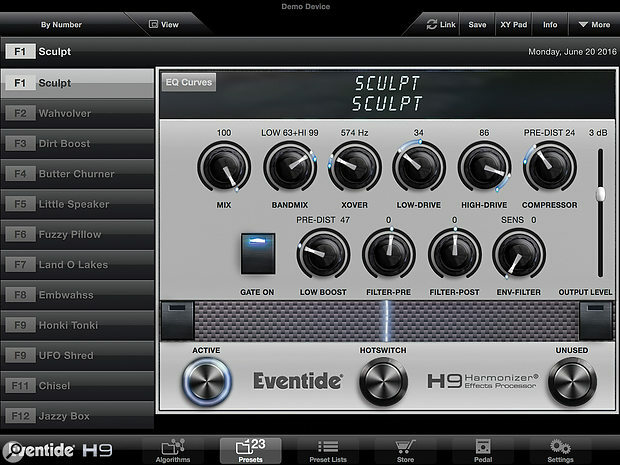 Sculpt makes a great studio tool as it enables some quite intricate overdrive sounds to be set up that you can then process using other plug-ins such as cabinet emulators. While some of the overdrive effects are reminiscent of old-school prog rock tones, there’s enough flexibility to produce classic rock and more modern sounds too. Given the low cost of the algorithm, I’d recommend it. $19.99 each, or free for H9 Max owners. $19.99, or free for H9 Max Owners.